Imposter or Impostor – Which Spelling is Correct? Home » Imposter or Impostor – Which Spelling is Correct? English has many words for people who pretend to be other people. If the person does so as a professional entertainer, he could be an actor or an impersonator. If she merely says one thing but does another, she could be a hypocrite or a liar. People who pretend to be other people for the good of their countries are called spies or undercover agents. Someone who pretends to be someone else for illegal reasons or for illicit personal gain is called an impostor. Or should we spell the word imposter? Some word processors do not flag either version as a misspelling. Do these words mean different things, or are the different versions of the same word? What’s the Difference Between Imposter and Impostor? 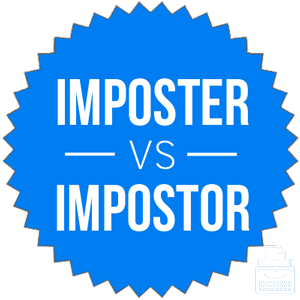 In this article, I will compare impostor vs. imposter. I will use each of these words in several example sentences, to give you an idea of how they should appear in context. I will also show you a memory tool that will make choosing either impostor or imposter easier in your own writing. What does impostor mean? Impostor is a noun that means a person who pretends to be someone else. This pretending is usually done for fraudulent gain, in contrast to an actor or an impersonator, who do so as part of an honest profession. “This is not the king; this is an impostor!” cried Lady Guinevere, tearing the wig from the Frenchman’s head as proof. When Michael Jordan was revealed to be an impostor cleverly disguised as Michael Jordan, the brain trust at the Chicago Bulls’ front office went quickly to work devising a counterattack. Impostor is a Latin loanword. It was first used in English in the 16th century and exists today unchanged from its original spelling. What does imposter mean? Imposter is an alternative spelling of the same noun. Impostor is the proper spelling of this word, but imposter has also appeared frequently for several centuries. Though imposter has maintained a steady presence in English for at least two centuries, impostor has always been used more frequently and most modern style guides prescribe this spelling alone. For example, The AP Stylebook lists the word to be spelled impostor. Similarly, both sides of the Atlantic seem to agree on this spelling, as impostor is the more common spelling in both American and British English. The popular American English usage guide Garner’s Modern English Usage lists impostor as preferred spelling, as does the popular British English usage guide Fowler’s Dictionary of Modern English Usage. This preference is corroborated by usage date on the spelling of each word. The above charts graph impostor vs. imposter in American English and British English, respectively, and as you can see, both sides of the Atlantic have a preference for impostor. Though these variants are equivalent in meaning, impostor is the proper version. It also appears more frequently in English books, so it will be more familiar to readers. Since impostor ends in -or, like related nouns actor and impersonator, you should easily remember to spell all of these words with the -or ending. Another trick you can use is to think of the “e” in imposter as standing for error. Is it imposter or impostor? An impostor is someone who pretends to be someone else for nefarious purposes. Impostor is the correct spelling. Imposter, an alternative spelling, is somewhat common but substandard. Despite their equivalent meanings, impostor is preferable to imposter in all contexts. 1 What’s the Difference Between Imposter and Impostor?